A simple, low cost way to eliminate sewage odours from pump stations, air release valves, sewerage networks & tanks. Green Dome® Odour Filters are a key component of any zero-odour sewerage network. Hydrogen sulphide odours from pump stations are a common problem. For a small pump station, this can be solved by fitting an Armatec Green Dome® Odour Filter. The hydrogen sulphide and other odours are adsorbed by a bed of carbon in a low profile vessel sited adjacent to the pump station. As a pump station fills with wastewater, air is displaced and along with it hydrogen sulphide and other odours. These can create a nuisance for neighbours. A common hydrogen sulphide concentration in air discharged from a pump station is only 1ppm to 2ppm, but this is a major problem as the odour threshold for hydrogen sulphide is just 0.005ppm. For large pump stations, the usual practice is to extract the odourous air from the pump station with a fan, and then treat the air with either a biological scrubber, a purpose designed carbon adsorption bed, or a soil bed filter. However for smaller pump stations, requiring only small air extraction rates, a far simpler solution is to install an Armatec Green Dome® Odour Filter. Standard Armatec Green Dome® Odour Filters are in two parts: (1) the base module is designed to be partially buried to minimise the visual impact, and (2) the top module that fits over the base module and is externally coloured in a shade of green. Alternative designs with the complete unit located above ground are also available. The units are designed for a very low pressure drop to ensure the air can exit the pump station via the unit. It is essential that the pump station is well sealed to contain the odours and ensure they exit via the odour filter. Armatec guarantees that the pump station will be odour free if the pump station is fitted with a "sealing pump station lid"
The low pressure drop ensures minimal back pressure on the pump station, and is achieved by selecting a large diameter in combination with a shallow carbon bed depth. Sizes range from 500mm diameter to 1200mm diameter. Air release valves on sewers emit intermittent bursts of air that can contain odourous hydrogen sulphide. Green Dome Odour Filters are ideal for containing and stopping these odours. The air release valve is ducted to the base of the Green Dome, thus containing the odours. All parts are corrosion-resistant fibreglass and plastic, so there are no corrosion problems. All that is visible above ground is the Green Dome. 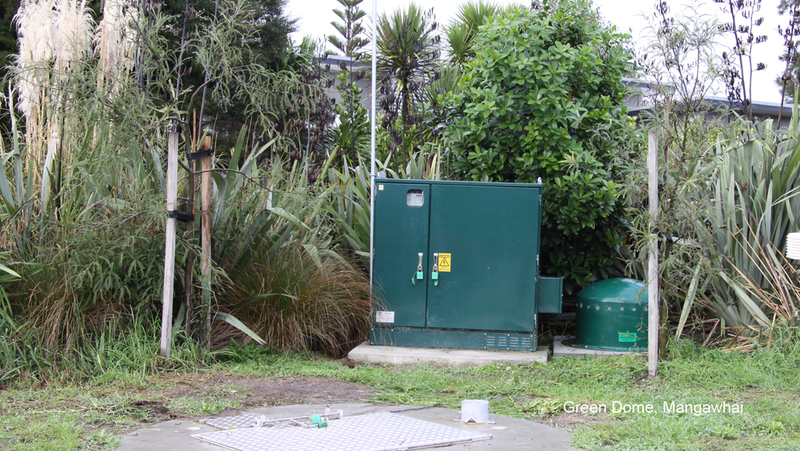 For details of a typical installation, download the pdf file on Green Dome Odour Filter on Rotorua Sewer Air Relief Valve. The life of the carbon depends on the air flow, the concentration of hydrogen sulphide odours, and the quantity of carbon in the unit. The carbon in a typical Armatec Green Dome Odour Filter will have an estimated life of 2 to 5 years. The life of the carbon can be monitored with a dipstick. The dipstick blackens as the hydrogen sulphide front moves up through the carbon bed. By checking the dipstick once or twice a year, you can estimate when the carbon will be used up totally, and arrange for replacement of the carbon before then. Replacement carbon is available from Armatec. The Green Dome Odour FIlters are constructed in robust fibreglass. They will require very little maintenance throughout their life. The fibreglass will withstand the odd knock without cracking. Any graffitti can be easily removed with standard removal products without damaging the fibreglass. Armatec Green Dome Odour Filters are fitted with proven carbon media formulated for humid airstreams. The carbon is low cost, and easily replaced when necessary. The carbon is either loose or contained within a replaceable bag, and this avoids personnel having to handle the "dirty" carbon. Armatec supplies replacement bags of carbon that you can keep in stock ready to make the changeout.